Voted San Diego’s #1 Boxing Fitness Gym in 2010 and 2011 by 10 NEWS A-List, American Boxing is San Diego’s BEST Boxing Gym for sports enthusiasts, athletes and fitness seekers. YOU WILL LEARN HOW TO BOX HERE. YOU WILL NOT GET PUNCHED IN THE FACE. THIS IS NOT A CARDIO BOXING CLASS. WE GUARANTEE THE BEST WORKOUT OF YOUR LIFE!!! If you want to have the body and fitness of a boxer, you must TRAIN LIKE ONE! What makes American Boxing so special? Simply put, our love of Boxing, Experience and our Learning Environment sets us far apart! We provide SMALL classes of less than 12 students and Personal Training in a setting that is clean with instruction that is second to none! Physically demanding, mentally engaging and a fun challenge, boxing classes can be used for FITNESS or sport. Boxing history dates back to early Rome and was part of the first Olympic Games. 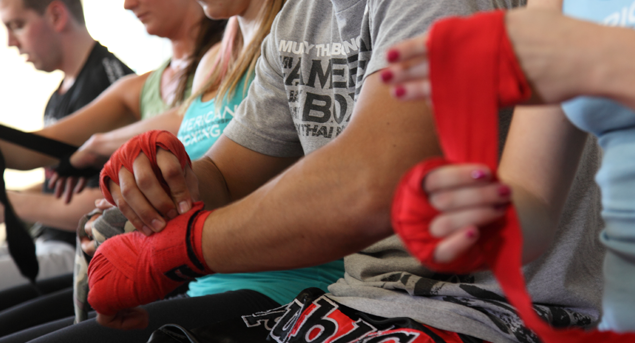 Our boxing classes in Pacific Beach are designed for MEN and WOMEN of all ages and fitness levels! American Boxing’s Boxing classes require NO EXPERIENCE and NO FACE PUNCHING! Learn the basics of western boxing from our highly experienced trainers. Boxing is a great fitness tool, confidence booster and sport! It is The Sweet Science after all! Coach Dave will at times incorporate other training tools including resistance and crosstraining to Boxing workouts to make this class the ultimate fitness experience. If this is your first boxing class EVER, be excited because it’s FUN to hit things that don’t hit back! Interactive drills with other students make the environment extremely fun and engaging. When other “cardio boxing” classes get boring after a couple months, American Boxing classes stay stimulating and demanding both mentally and physically thru the years! Ladies and gentlemen, this is the class you wished you had found years ago! Tons of technique and footwork drills to help you pick YOUR STYLE based on YOUR natural abilities! At American Boxing, we make the sweet science, scientific for sure! This boxing class will push your skill level to the amateur boxing level. There is still no free sparring in class, so, ladies and gentlemen, your faces are still safe 🙂 Learn how to move and angle while striking with power, speed and efficiency. WE PROMISE that you will learn more in just 1 American Boxing “Boxing Class” than in any other San Diego Gym in MONTHS! That is our goal and that is what we are told REGULARLY from other SD gym goers! Sparring Classes are FREE with every membership and you may attend as long as you have proper safety equipment. If you are interested in sparring check out our class schedule for Sparring times. You can also give us a call at (858) 581-BOXING (2694) to make arrangements to test your skills! You can get some nice ABS are result of regular boxing training. It is said that in ancient times the Spartans used Boxing as a tool in their training. It doesn’t get any better than the physique of a Spartan or even a Boxer all from a fun 50-minute boxing class! American Boxing San Diego is a USA Boxing facility and sparring is encouraged, however it is not required.